I have a tiny design where it could be nice mounting either an SOT-23-6/SOT-26 or an SOT-363/SC-70-6 – note: these are tiny logic devices, no special provision for dissipation, possibly hand mounted in small numbers, probably reflowed. Did anybody tried mixing these? 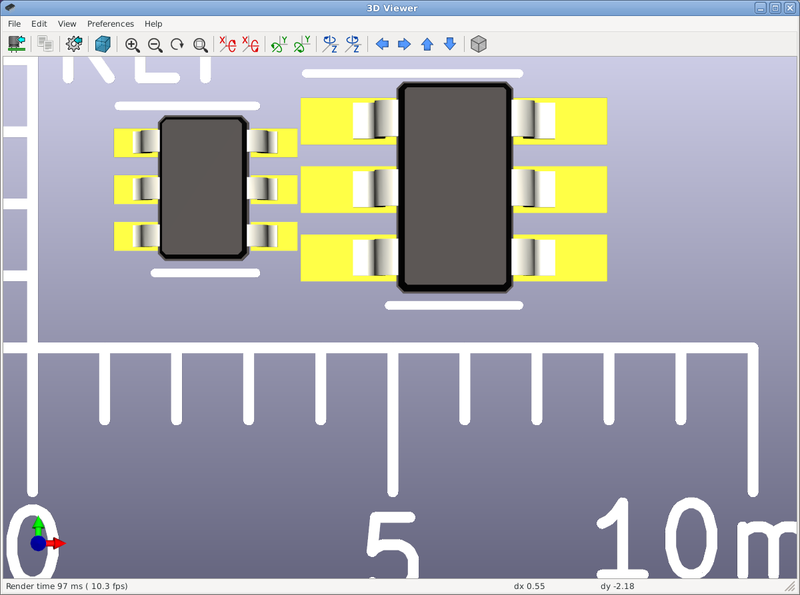 Apparently, if you overlay the two footprints coming with KiCad 5.1, in the hand soldering version, looks like it can be done just centering the smaller footprint over the larger one. However I’ve some doubts in case this setting enters an oven, with the smaller part risking to float. And I thought SOT-23-6 was small. I put both packages in a screenshot together with a"Gauge_10mm_Type2_SilkScreenTop"
I have hand soldered SOT-23-6 by hand for repair work and these are already so small it becomes difficult to do reliably without magnification (and plenty of flux). Because of this you will appreciate any help you get from fitting footprints on the PCB, and putting these footprints on top of each other will probably cost you more in frustration and rework, than it saves to respin the boards. PCB’s are cheap, also in low quantities. If you want to try it, I recommend to design a test PCB with a few different ways to combine these packages. You will probably have the most chance of success if you only use the small package Footprint and widen pads 1, 3, 4 and 6 on the outside. Pads 2 and 5 of the pads from the SOT-363 should not be narrower than the physical pins of the SOT-23 though, because that would eat into the soldering clearance and increase risk of solder bridges. I had a look at it in the 3D viewer, and pins of the SOT-23 are wider than the pads of the SOT-363. This would combining the footprints on top of each other a job I would not want to solder. I do agree, it’s just that the SOT-363 size gives me more part options from different manufacturers (and prices), while managing two different boards would cause confusion in the storage/production people, so I’d like to avoid it in advance. The plus with SOT-23 is exactly that: needing a few more mounted boards make that feasible by hand soldering, as they are ten components boards. How important is your total board space? Is it acceptable to place the footprints simply next to each other instead of on top of each other. Placing footprints alternatives on top of each other is a common practice, but in this case it simply does not seem to fit very well. How good is the availability of your parts? Are there big price differences? It may be that it is all more trouble than it’s worth. Your goals is also a bit fuzzy. You talk both about hand soldering and ovens. Hand soldering is almost always doable. For reliable production work you simply need fitting footprints, because the time of rework costs many times more the price of the components. for a few prototypes time is not so much of an issue and you can hack almost anything together. It’s an adapter board that I have to fit in a tight space. It’s still early to understand if it will be used in tens, on demand (and that can still be managed with hand soldering), or produced in hundreds with regular machine assembly. You can also simply buy a single reel with a few thousand components and be done with it. Componets from LCSC often seem to cost half or less from what you pay with Mouser / digikey / Farnell or other western shops. LCSC sometimes has “different” component values, so you ma want to exchange part numbers for transistors to see what they have. LCSC also sells parts from Chinese manufacturers you do not see in the western shops. element14 have them as TSOP-6. Same pitch as sot-23. Just a bit narrower. @jos Thanks, that should be the same as SOT-23-6 in disguise (if you mean those parts from Nexperia). A lot of fuss on these packages names, On Semi made a funny example list too.